Some people believe that if you’re thankful for what you have, you’ll always have more. That’s where your gratitude log comes in. Feeling grateful is a powerful emotion. It can influence the way the universe responds to your efforts, your goals, and your desires. Perhaps you’ve heard of The Secret? It’s a book (and film) that explains the law of attraction and the power of gratitude in an easy-to-understand way. The greatest lesson I learned from it is that there is something undeniably powerful about saying ‘thank you’ to the universe for the things you have and the people you love. Once you feel appreciative of what you already have, you open yourself up to receiving more of what you want and deserve. This is why I always make room in my bullet journal for my gratitude logs. I find it helps with introspection and can even influence my productivity by placing me in a positive frame of mind. It also helps to point out the things I’ve grossly taken for granted – like running hot water or central air conditioning. Handwriting everything you’re grateful for can help you appreciate what you have in your life so that you can tackle your to-do list with a fresh perspective. Even when you think things haven’t been going your way, there’s always something to be grateful for. There are always things in your life that other people pray for – like a loving spouse or a home-cooked meal at the end of the day. 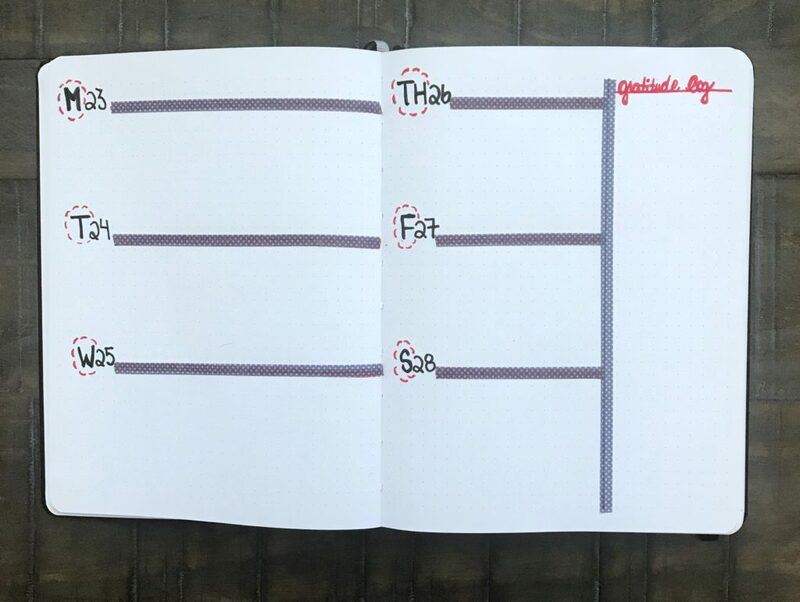 If you love bullet journals because it provides you with the opportunity to be creative, then you’ll love adding this log alongside or within your layouts and spreads. A gratitude log can even have a positive impact on your relationships. I know that I personally cannot complete one without thinking of my husband. I feel grateful for him every single day! Taking those few minutes to think of him in that capacity truly serves as a reminder of how great of a person he is. Imagine if you did this with everyone you love? I think it’d help you feel more appreciative of the people in your life. If you’ve never used a gratitude log before, I recommend you try it. There’s just something about taking time out of your day to write down what you’re thankful for – whether its a big thing like a job promotion, or a little thing like a new book you’re excited to read. If you’re a bullet journal aficionado, then I don’t have to sell you on the power of writing things down. You already know! Below are a few examples of 3 gratitude logs I created. They’re easy to replicate and they work well for me. Sometimes I use up an entire page for the spread, and sometimes I squeeze it into my weekly or daily layouts. The time of day in which you use your gratitude log is entirely up to you. Some people like to do this exercise when they get up in the morning before they start their day, and some people prefer to do it at night after they get ready for bed. You can even do it twice a day: before you leave your house AND right before your head hits the pillow at night. I’ve done both and I love it. This is my monthly gratitude log. It’s a super easy layout. Simply write “Gratitude Log” in your heading, and number the days of the month in a horizontal line. Make sure to flip to this page every single day so you can write down something you’re grateful for. The wonderful thing about a monthly gratitude log is that when the month is up, you can flip back to this page and read everything you’ve written down for the past 30 days. (Make sure to add the page number to your Index for quick access). It’s an excellent way to identify patterns in your life and see what you’ve taken the time to appreciate. I’m not a naturally artistic person (I cannot draw!) so I like to add some flair to my bullet journal spreads with pretty stickers and washi tape. I know you might be intimidated by all the artistic and detailed layouts you see on Instagram and Pinterest, but you shouldn’t be. Bullet journals are meant to be customizable and unique to each person, so just do what works for you and what you have the time for. You’ll see that as each week goes by, you’ll feel more and more comfortable with the types of spreads you create. Plus, there’s a host of bujo supplies out there that make it easier on those of us that are less artistically inclined. 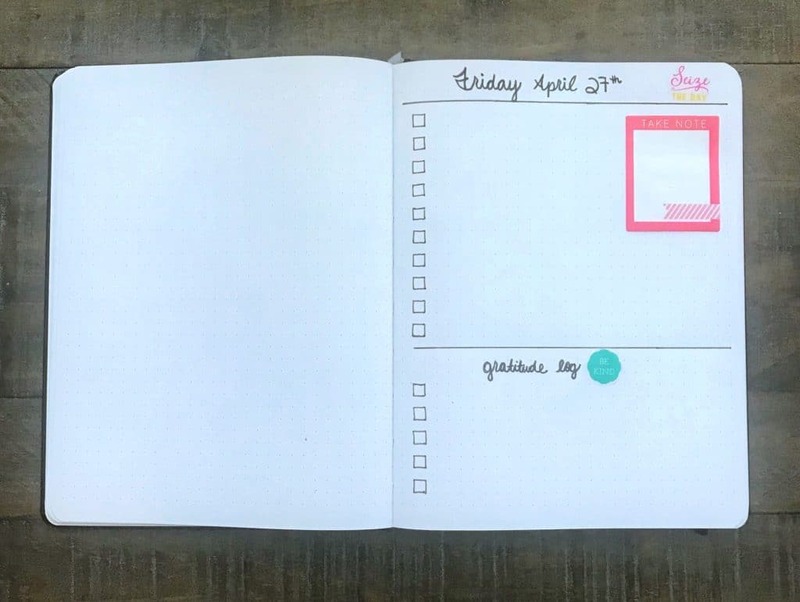 If you cannot live without your weekly spreads, then you should definitely try incorporating a gratitude log into your weekly. There are endless ways to do this, but this is how I’ve done it in the past and it’s worked well for me. You can add your gratitude log to any space on the spread, such as the left-hand side or the bottom of the page. For me, including the log on the far right corner of the page helps to draw my attention towards it so that I’m easily reminded to complete it before the week is over. I don’t know about you, but leaving blank spaces and incomplete tasks in my bullet journal drives me absolutely mad! I get a sense of satisfaction when I glance at my journal and see that I’ve been productive and have completed what I said I would. It’s all about accountability! I’m a huge fan of dailies. I live and breathe according to what my daily spread says! I use dailies every single day and I just cannot do without them. My daily layout not only serves as my to-do list, but it also serves to remind me to practice gratitude each and every evening. It allows me to reflect on the day, on my emotions, my accomplishments, and my shortcomings, too. I use it to see whether there’s room for improvement somewhere and whether certain tasks and systems have actually improved my productivity. For this daily gratitude log, I simply left a blank space at the bottom of the page to write down what I’m grateful for that day. I have plenty of room to include my daily to-do tasks, so everything works out perfectly. 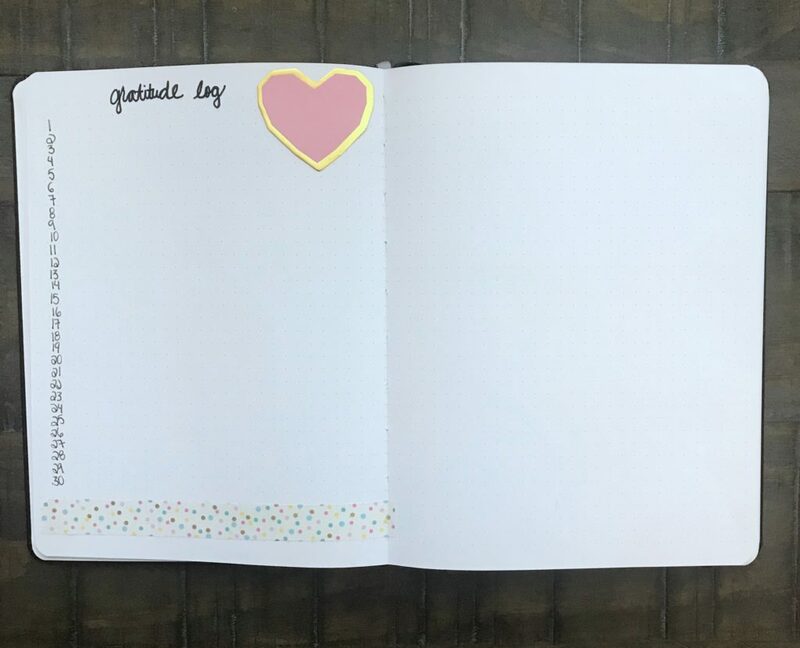 This is probably the easiest way to incorporate a gratitude log into your bullet journal – unless you don’t like using daily spreads! Remember, there’s no rule that says you can’t use a monthly or weekly gratitude log IF you’ve already included one in your daily spread. It’s your bullet journal – you can do whatever you want! Try writing down the little things you’re grateful for in your daily spread, and then reserve the bigger things for your monthly or weekly gratitude log. It’s a great way to fit in as many things as possible! That sums up the 3 ultra-simple ways in which I incorporate a gratitude log into my bullet journal spreads. It’s incredibly easy to do, not at all time-consuming, and it can yield positive results. I think it’s a practice that can make you feel good about your life because it almost forces you to look at things in a new, more positive light. And who wouldn’t want to benefit from that? One last tip: ALWAYS remember that your spreads don’t have to look beautiful. If your bullet journal is helping you to be more productive and organized than you’re doing it right! If however, you crave a little more creativity, check out these monthly spreads and weekly spreads. These bullet journalists are obviously great at drawing, hand-lettering, and decorating. Take inspiration whenever you need a little help with your spreads!